IT’S TIME TO GET ROCKING WITH A LITERATURE-BASED MATH SITUATION!!! Woooooo!!! Our unofficial-but-kind-of-official district math module recommends starting the year off with understanding multiplying by 0, 1, 2, 5, and 10. It aligns with an Engage NY module and a Georgia module, but I wanted to start our unit off with a problem-based activity to gauge their understanding and to give us an anchor for future learning. 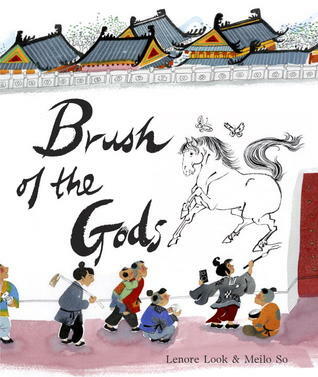 Last week, I read Lenore Look’s magnificent Brush of the Gods, and my kids adored it. 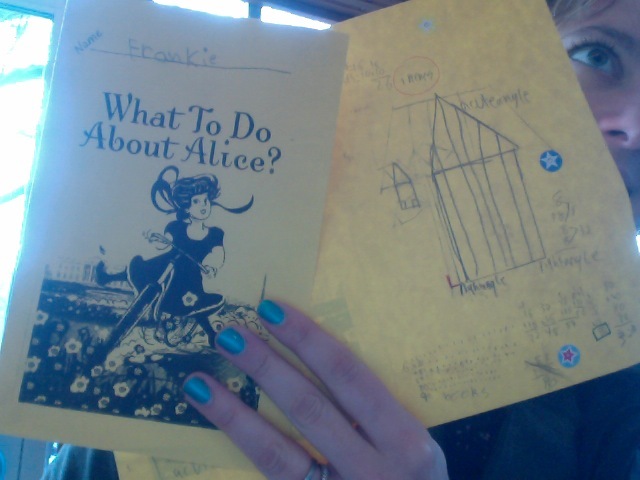 Math specialist Siobhan and I plotted a pretty rad activity based on the main character’s huge fresco murals. I’m excerpting some of our lesson in the text of this post, and the whole activity is available for download at the end of the post. I am posting this activity on a Sunday and I plan on launching this in class tomorrow. So check back in later this week and see what modifications I needed to make on the fly! NOT an image of Wu Daozi! 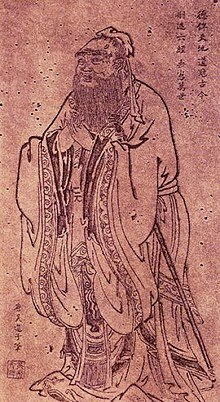 This is his portrait of Confucius. Wu Daozi was a legendary muralist and painter who worked in Xian during the Tang Dynasty. I shared these photos from my 2009 trip to Xian (the first two photos in that post are actually from the Forbidden City in Beijing) to provide a sense of scale for the city walls. Then I’ll share this task with my students (it’s explained using the GRASP model for classroom-based assessments / problem-based learning activities). Your task is to create a mural in the fanciful calligraphic style of Wu Daozi. Your mural will be a fresco, using plaster, along with any colored pigments you choose. You are an artist inspired by Wu Daozi visiting the Chinese city of Xian. Your artwork will be seen by all who travel into, out of, or around the city of Xian. 32.9 million tourists visit Xian every year (http://www.chinatouronline.com/, 2008). The tourism board of Xian needs to know how much your mural will cost in Yuan, the national currency of China. The challenge involves designing a mural on a grid. You have one week to submit your design to the tourism board. You will create a mural design, and you will also present a cost analysis of your design. The tourism board of Xian needs to know how much money to budget for the mural, as well as the amount of supplies you will need. 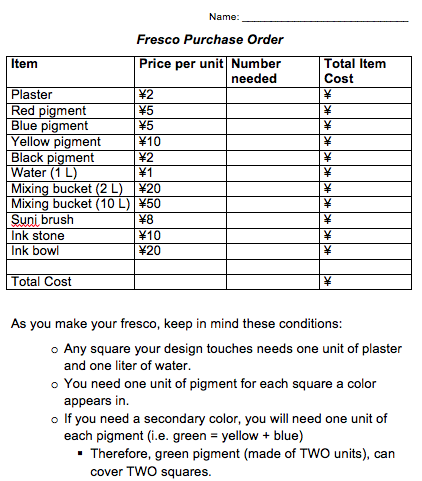 The total cost of your plaster, pigment, and other supplies. A breakdown of your costs. A mathematical justification of your costs. Your mural, designed on grid paper. A reflection sharing budget suggestions with aspiring artists. Photographs of your budget calculations. We designed a price sheet that would encourage students to perform repeated addition on numbers they have experience skip counting with. We also included some items students would need only one of (like the brush), to gauge how they choose to add that toward their total budget. Siobhan helped me plan a 2nd and 3rd grade rubric with standards from both Common Core mathematical practices and content. Feel free to use these plans however you see fit, but comments are always appreciated so we know how successful things have been in your class! I acknowledge that there are many other directions I could have taken this activity. I plan on revisiting it later in the year for an area/perimeter situation that BLESSEDLY DOES NOT INVOLVE GARDENS, but for now, my main goal is for students to explore repeated addition and patterns with 0, 1, 2, 5, and 10. Goodies here! Click click click! Brush of the Gods lesson plans & rubrics. The first few days of school in September are precious. You’re setting the tone of your community, establishing expectations and routines, and keeping your fingers crossed that you’ll be able to squeak some content in along the way. 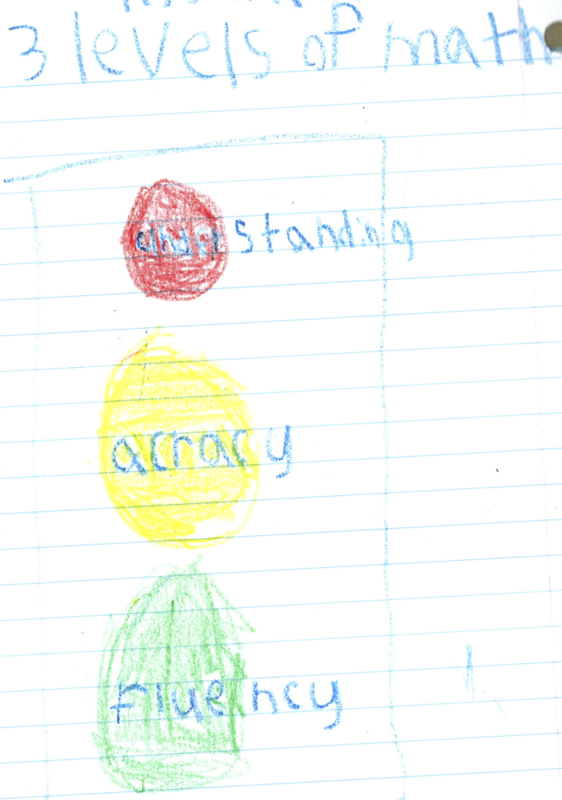 I’ve noticed that a lot of beginning-of-the-year activities center around literacy. In a sense, that’s fantastic, because high-quality children’s literature has an incredible power to bring people together. But I can’t shake the niggling feeling that yet again, math receives the short end of the stick. 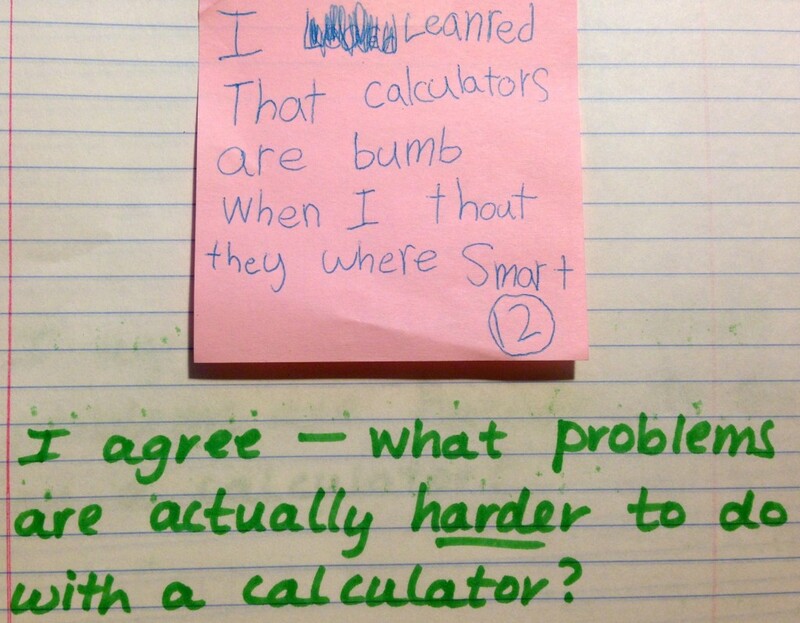 After years of gentle coaxing from colleague Siobhan Chan (you’ll hear plenty about her in the year to come, I assure you), last fall I committed to starting my year using The Art of Problem Solving from Teacher to Teacher. The Teacher to Teacher curriculum has its flaws, and it hasn’t been aligned to our district and state standards in a bajillion years, but I have yet to find a better way to kick off math than with The Art of Problem Solving (I refer to it as AoPS in my lesson plans, but I don’t know if that’s an official acronym). 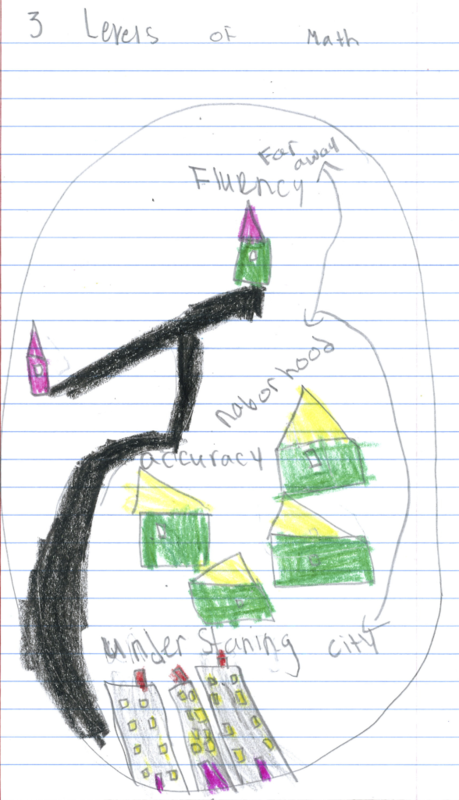 While explaining it, I used hand motions to indicate that understanding was the biggest, most vital piece of our work in math, then we assure accuracy, then we strive for fluency. It guided our practice throughout the year, and they emerged the most successful class of mathematicians I’ve had in six years. Understanding: This is the whole ocean. Nothing further can happen until we get here. If we’re not there yet, that’s fine, because at least we know what we’re striving for — our understanding is the most critical piece. Accuracy: Kelp and other seaweed will die if it’s out of the water. Our accuracy is meaningless unless it is grounded in our understanding. 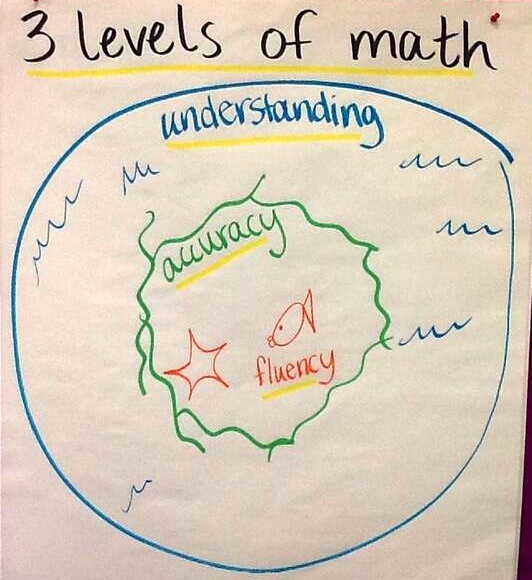 Fluency: If we work on our accuracy in a dedicated way, fish and other critters will come to live among the seaweed. 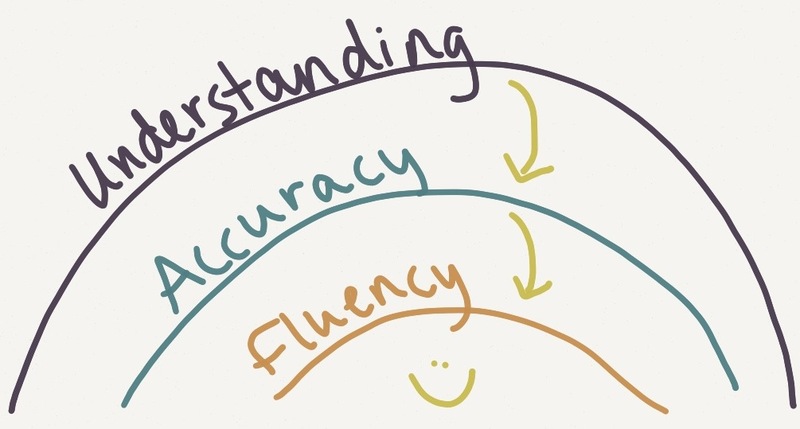 It often happens naturally, but we can use strategies that improve conditions for fluency to flourish. 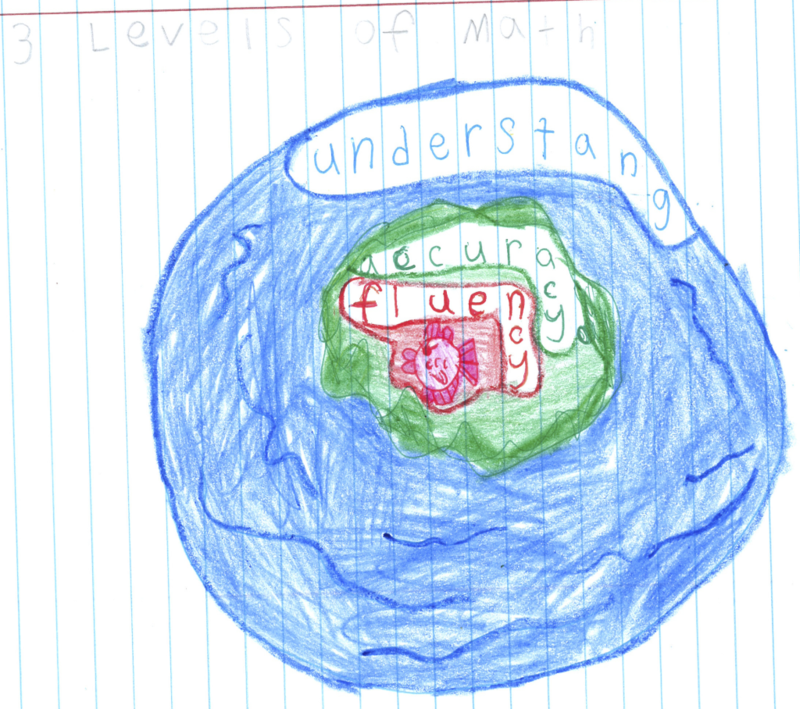 Then, students created their own representation of the three levels of understanding in their math notebooks. They provided remarkable metaphors, and also gave me insight into their thinking. 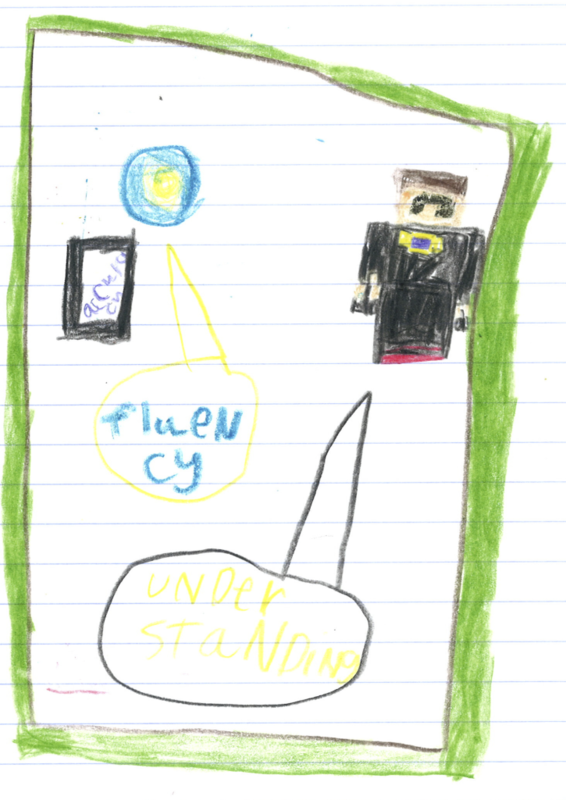 I’m not really permitted to post student work on a non-district site, but you can view the work of everyone whose parents signed a release at our Artsonia site. So I’ve cropped a lot of these and removed student names, etc. Many kids drew something very close to my example, which was totally fine. And some started with my basic example, but took it a step in a different direction. 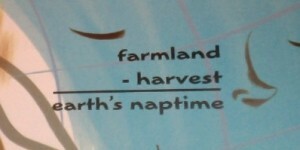 Behold, two representations that take place on the savannah and on a farm, respectively. And then, some of my students blew my mind. I didn’t have them write their explanations, as this was our first activity of the year and I wasn’t ready for that piece. I did record some of their comments, though. Although I’m all for partner collaboration and I don’t mind if students’ work is similar, I was concerned that my CLD student (CLD, or Culturally & Linguistically Diverse, is the new, politically correct way to refer to ELL or ESL students) couldn’t explain his picture, while the person sitting next to him had an extremely similar representation and could explain his. This was a signal that I need to follow up with my CLD gentleman. I’m excited to see what comes up next week in math! I always love comments and suggestions! 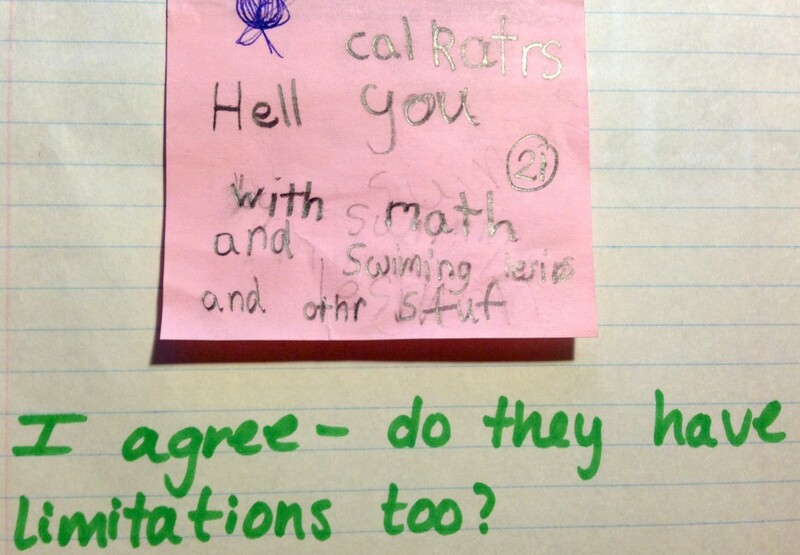 Time to rethink my integration of science with math. My attempts to connect proportions of the human body with measurement went down in flames in my entry last year, so I’m focusing on Systems, Order, and Organization related to sound this time. Ugh. Not helpful. 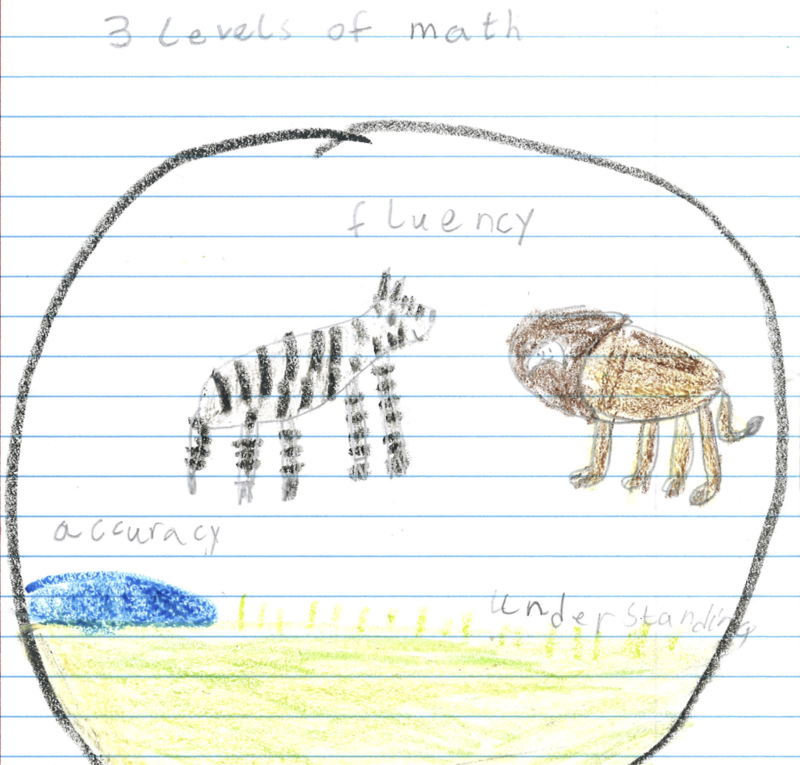 It’s worth noting that there are a whopping two math extension activities in this entire unit. The wise and enthusiastic Katie Weichert gave me some great ideas to chew on and think about. I wish I saw her more often. But in her absence, I had to get a move on. So I started trolling the Internet. This Aztec music lesson seems compelling. 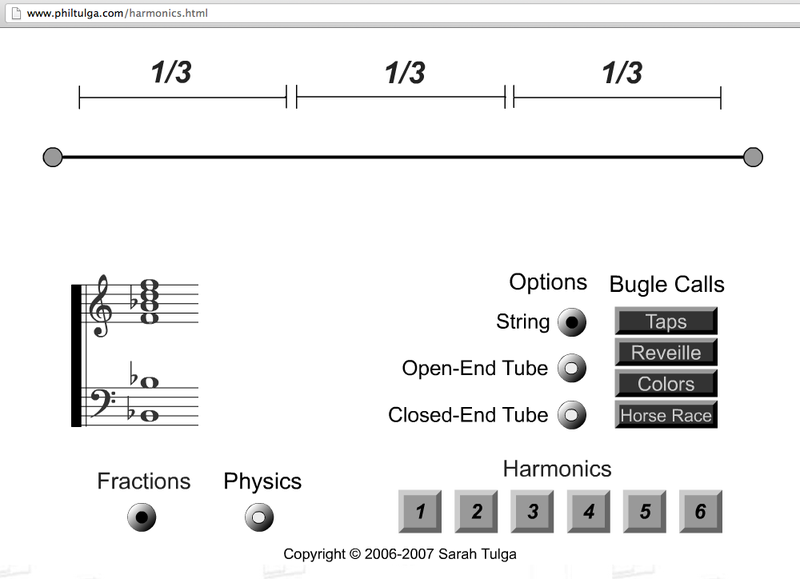 I’m also interested in harmonics, but I don’t know how to build this into a full lesson. My students already use harmonic series as a procedure to line up from music class, so I wouldn’t need to go over the basic musical idea of third and fifth intervals. I imagine I could show snippets from Donald in Mathmagic Land and have students generate questions from that? Yesssssss, I could totally do that… That way the learning would be authentic and related to the curriculum we already have in place! (emphasis is my own) Now in looking at moving from merely interest to investigation…… I suppose that recording student questions will take care of that fear, right? Then having their questions shape the following lessons? Hmmmmm. Of course, there are a wealth of videos available on sound and math, but much of the information is so complex that I can’t figure out how to simplify it. Anyway. Let’s see how this goes. When you take time for yourself, good things follow. 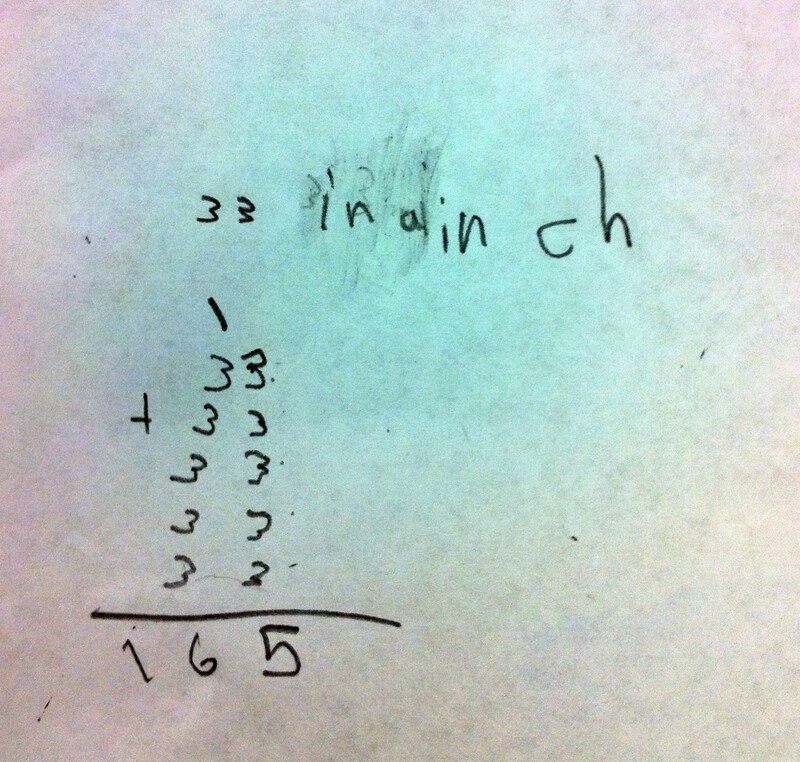 In this case, it was some REALLY AWESOME MATH. Friday morning, I missed the bus (oops) and was able to drive to work at a legal speed. I had an opportunity to drink some nummy nummy coconut mocha coffee and read my Wall Street Journal. And lookie what I found! 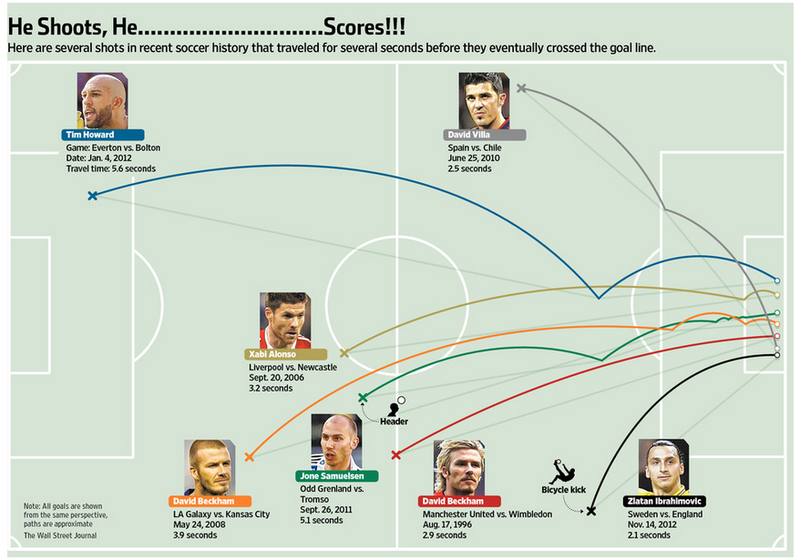 The art of the slow-motion soccer goal. I’ve been thinking a lot about Dan Meyer commenting on how we spoon feed each step to a problem solving situation, and so today, I went out on a skinny limb and used this graphic to help us work on our measurement skills. I wasn’t sure where our work would take us, but we’re early on in the unit, so many of my students are still working to measure accurately using a ruler. I showed them the graphic, and Samuel helped me pronounce all the players’ names. He was our resident expert. Then I opened the floor to mathematical questions. 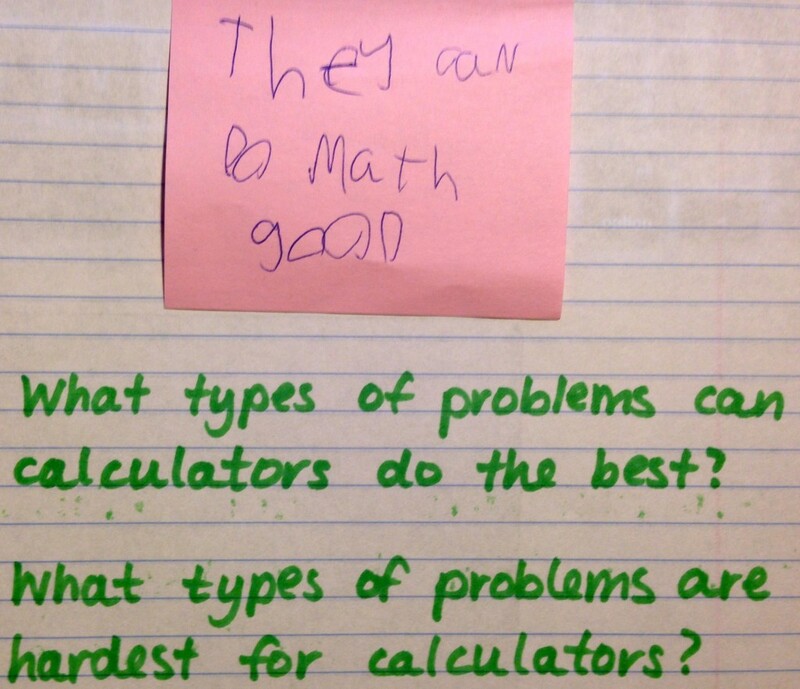 Here’s what we brainstormed as our big questions. The questions with green dots to the left are the ones we decided to pursue. Then, people started asking more “nitty-gritty” questions, which we identified as being the “questions along the way” you had to answer to get to your big ideas. We kept this poster up as we worked. 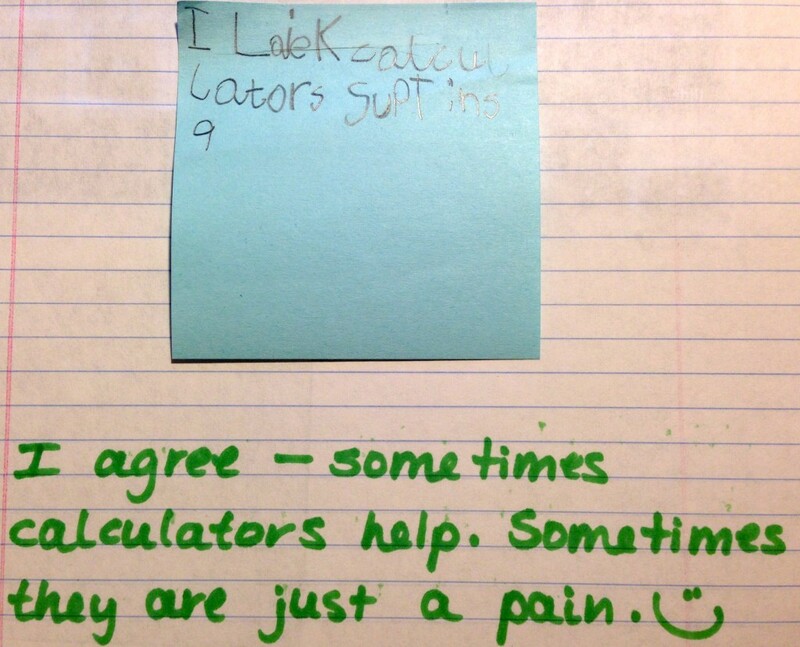 I stayed near my computer so I could capture students’ comments. “You need to know how big the field is,” Savanah spoke up. I handed her my iPad so she could find the field size. She paused. “Do I need to know like, how BIG it is or how long the sides are?” “I think you’re asking me whether you need the area or the perimeter?” “Yeah… ohhhh, I need the length of the sides.” Here’s the information she found. They did the same for the other side. Then a group of students wanted to determine the linear distance the ball traveled for each player. I asked how many inches long their picture was, and Marcos stopped us all. Marcos: Okay. 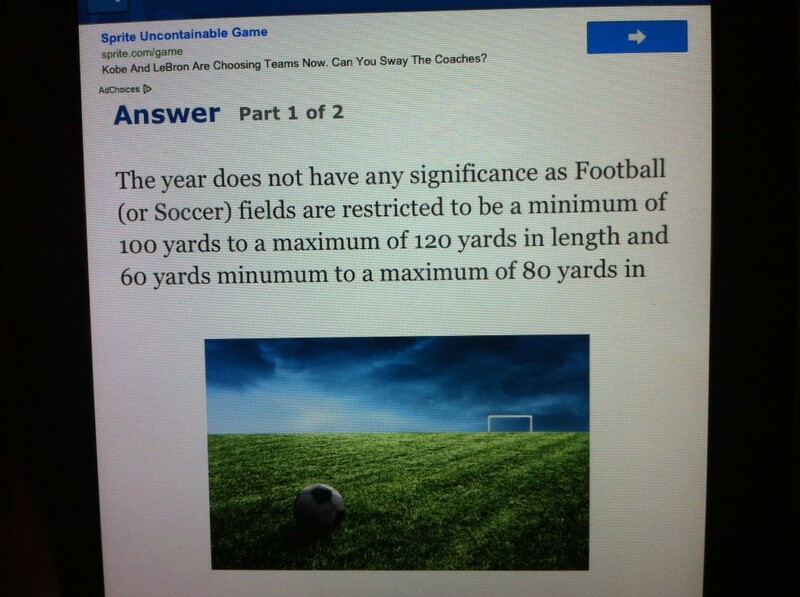 So the field is 11 inches long. Then a few of us worked to create this poster. 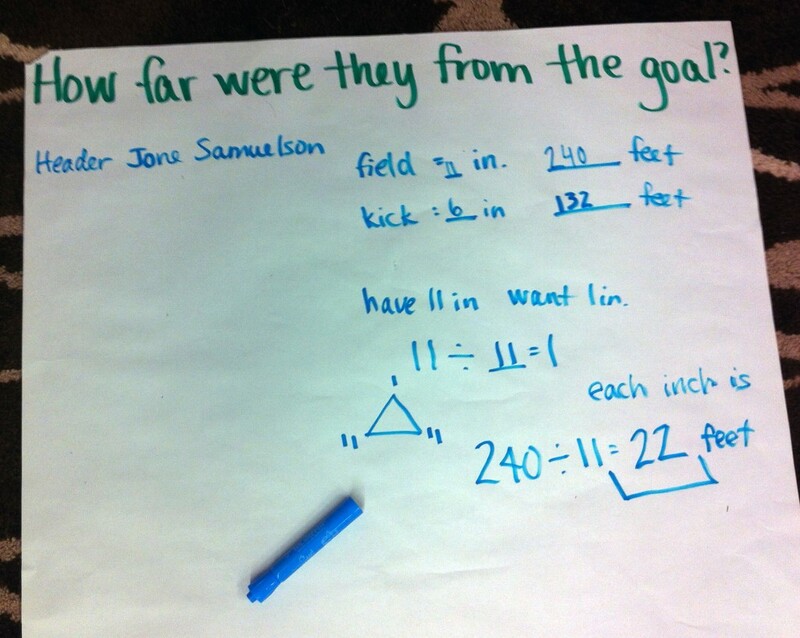 We knew the field was 11 inches in our image, but we wanted to know how far just ONE inch would be because then we could find out how far Jone Samuelson’s 6-inch kick actually went. We also knew how long an actual field was, so we tried to find the relationship between the two. Using a fact family (the triangle drawn above) helped us figure out the ratio. Or. What I initially THOUGHT was the ratio. DO YOU SEE MY GLARING ERROR??? I didn’t notice until lunch. I neglected to convert the 240 feet into inches so the units matched. Drat. I frantically called AP Calculus teacher James Brown to make sure I didn’t make any further errors. So after lunch we converted 240 feet into inches, THEN used the ratio and found out that one inch in our picture equalled approximately 33 feet. Some students switched to using calculators for these larger computations, which gave us a chance to talk about how calculators represent 1/2, equivalent fractions (5/10), etc. 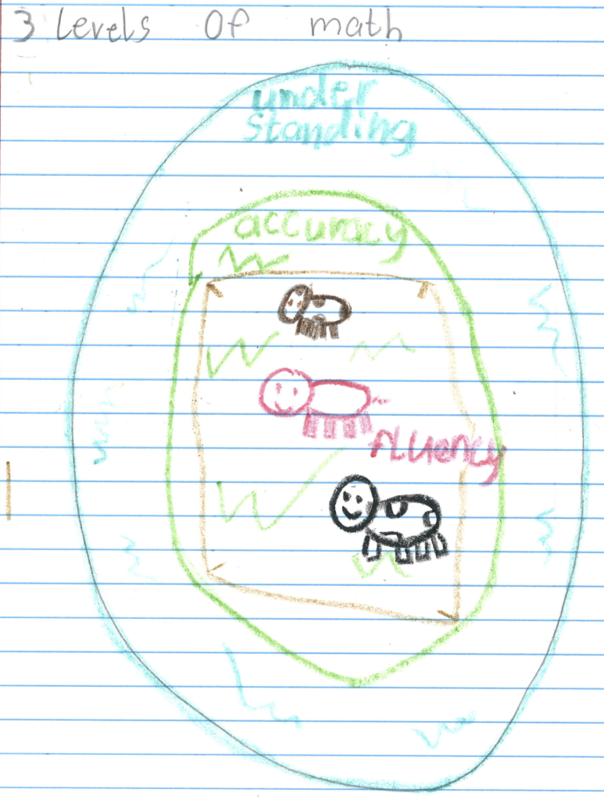 Above, Alejandra calculated how many feet David Villa kicked the ball (5 inches, according to her measurements, making the kick 165 feet). I asked her about the “33 in. 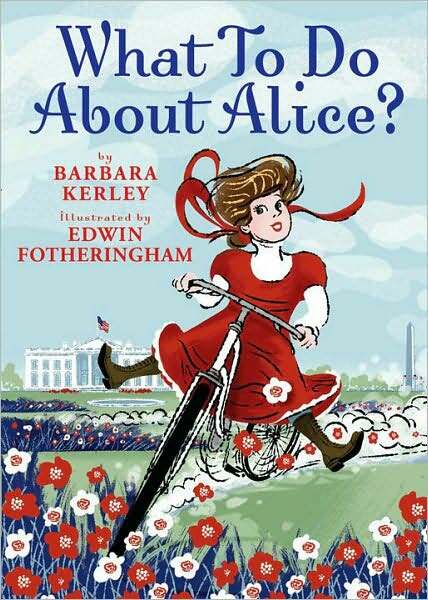 in a inch” she wrote, and she said, “Oh no no no, it’s not 33 INCHES or that would be like a mini soccer field.” So she was also looking at reasonableness of answers. 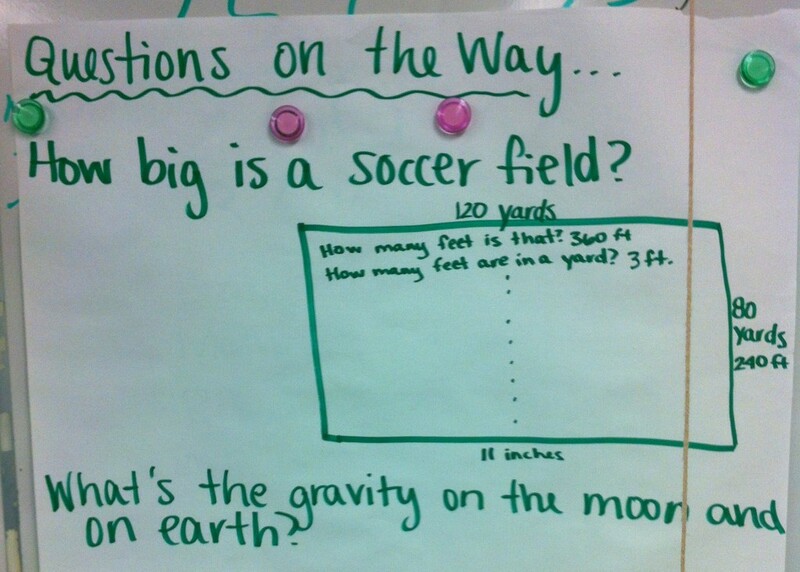 Another group wanted to know how far the balls would have gone if they were kicked on the moon. Again, I told them to ignore the parabolic motion and just look at linear distance. I know the physics of this aren’t entirely correct, but I didn’t think it hurt the integrity of the original problem situation. Oh, actually! Selam originally asked how far the ball would go in SPACE, but Maya pointed out that if the they were in space, the player and ball would both push off each other and the ball would never land (AMAZING INSIGHT, RIGHT???). So we clarified that the ball would be kicked on the moon, where there was still a force acting on the ball, but a lesser force than what we’d find on Earth. 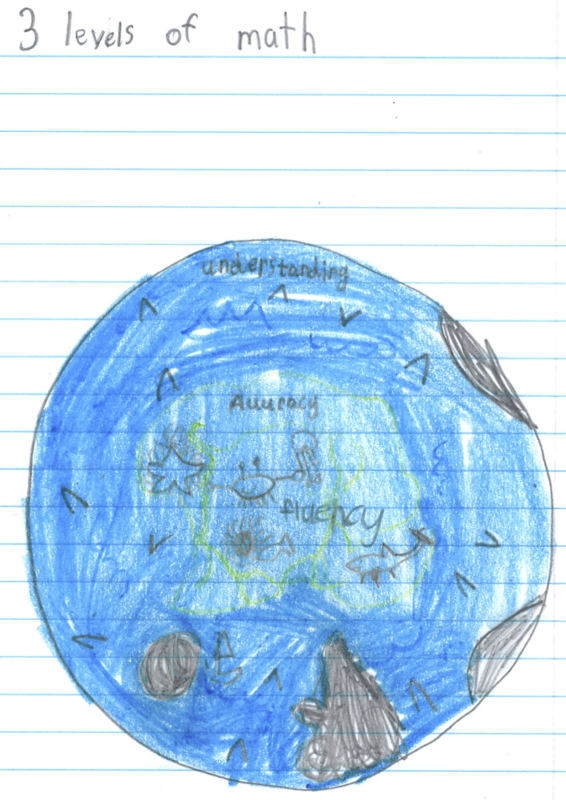 Adam went to the classroom library to find out what the gravity was on the moon. Here’s the passage he found, from the DK Eyewitness Book UNIVERSE. 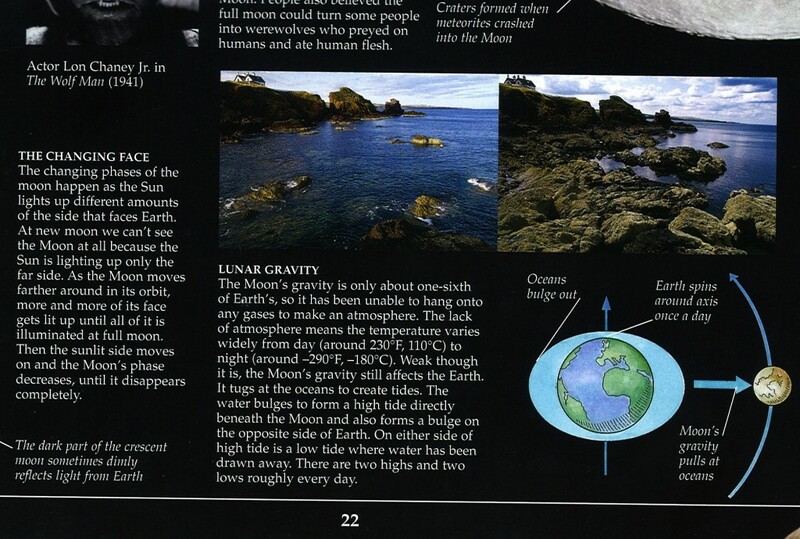 Eayn: It says the gravity is one-sixths of Earth! Me: So the gravity is 1/6 of the gravity on the Earth. So if we are converting from the moon, what would we have to do to the distance we calculated for the ball kicked on Earth? Adam: Multiply it by three? Me: Where did you get three from? Milena: Multiply it times five. Me: Five? Where did you get that from? Milena: If the moon’s gravity is 1/6, then the rest of the fraction that’s left is 5/6. Me: Ohhh, I think I see what you’re picturing in your head. But think of the gravity on the Earth as being one whole, and the gravity on the moon being 1/6 of that whole. 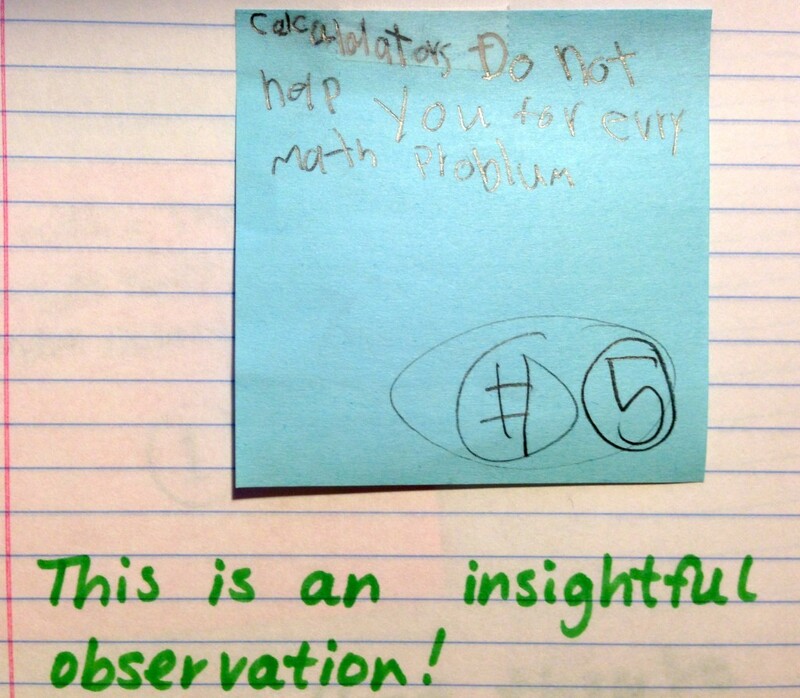 You’re not looking at the other 5/6ths. Vy: You’d multiply it times six. Me: Where did you get six from? Vy: If it’s dividing by six to get the pull on the moon, then you’d multiply by six to show how much further the ball would go when it has a sixth of the gravity slowing it dowwn. Me: So you’re saying that fractions can be a way of dividing. Vy: Yep. And then the opposite, er, inverse, is multiplying, so you times by 6. As we approached second recess, we posted what we’d come up with so far. 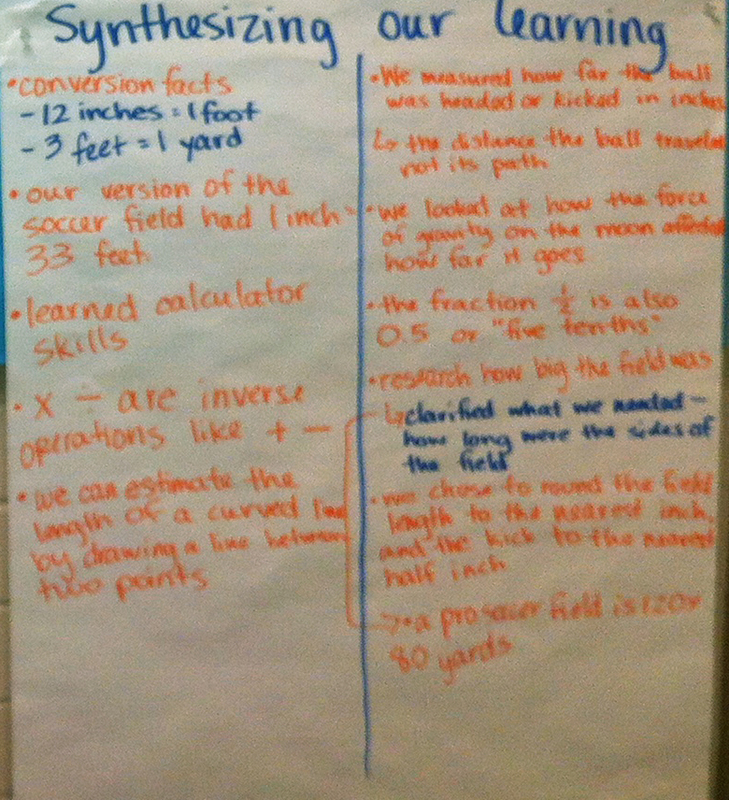 We also reflected on what we’d learned over the course of the day, and on the math we used. As you can see, we didn’t finish everything, so some students asked if they could finish the calculations during Math Daily Five. UM, YES OF COURSE. 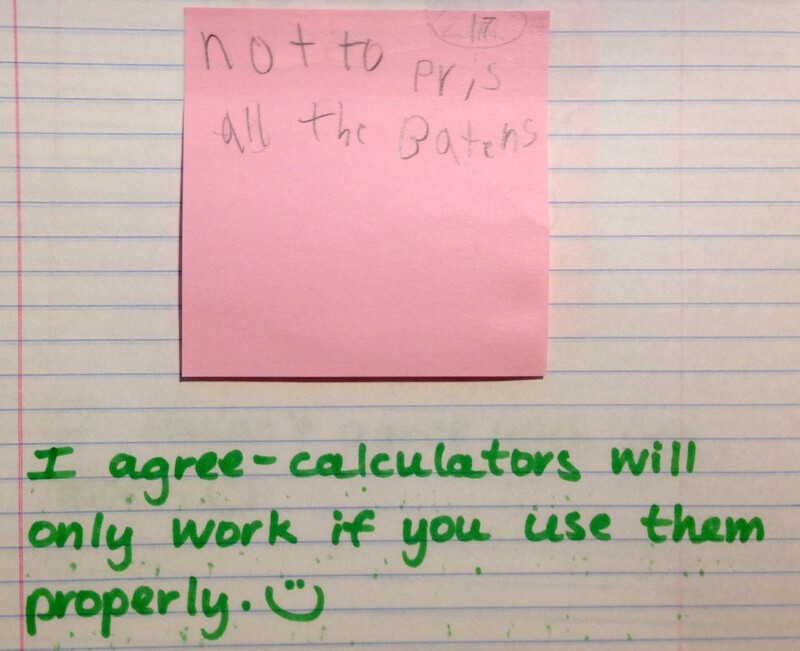 What suggestions or modifications do you have to offer me and my students? Where can we take things from here? Other thoughts? I arrived in Dallas yesterday evening. This is an enormous city. 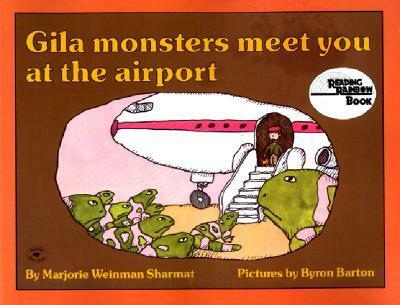 I flew into the airport featured in Gila Monsters Meet You At The Airport. It is an enormous airport. I was met, not by a gila monster, but by the lovely educator-history-buff-museum-gal Elaina (Hauk) Carlisle, who I’ve known through MSU-genius-friend-and-roommate Franny Howes for close to ten years, but have never met in person. She has a fantastic house with epically tall ceilings and a friendly, happy mutt who looks like a Muppet. And a husband, who is accustomed to lengthy teacher-talk conversations. We drove through Dallas. I saw the place where John F. Kennedy was shot, which is frankly still giving me extreme feelings related to creepiness and the power and gravity of history and all sorts of other random emotions. Yes, I saw the grassy knoll (it’s small). Yes, I saw the book depository (it’s ordinary). I am still processing how such a short glimpse — we literally just drove through the intersection, not stopping — of an historical site can have such a big impact. WE ATE DELICIOUS FOOD. Lockhart Smokehouse is close to my hotel, so it was a perfect choice. A DELICIOUS CHOICE. Then I came home, reserved my Wednesday shuttle to the convention center, and fell into bed to read The Adventures of Sherlock Holmes. I’m trying to be reflective and thoughtful about tomorrow’s presentation without freaking myself out. I’ve been only marginally successful. I fretted. But I reread the speakers’ notes and focused on this bit, “Your presentation method should be consistent with and model strategies that NCTM advocates for classroom teaching (Example: Principles and Standards for School Mathematics).” Hm. 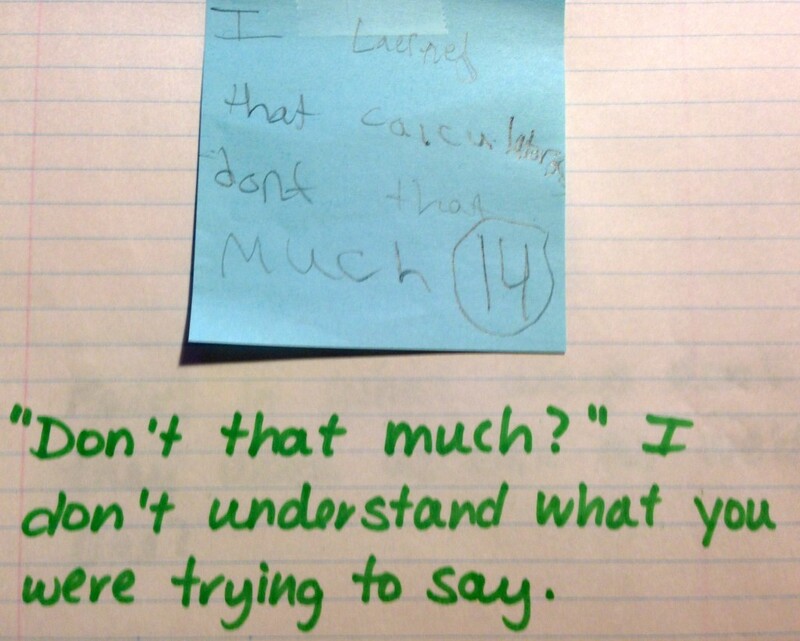 We’re always complaining about math standards going a mile wide and an inch deep, right? So I got myself in check. What better way to demonstrate the importance of deeper understanding by anchoring this brief (hour-long) session around one common text? After all, I told myself, THE TITLE OF MY FREAKING PRESENTATION IS DEEPENING LITERATURE CONNECTIONS. I mean, this way, even if they hate my presentation and the strategies presented, they’ll be able to bring news of a fantastic new picture book back to their schools. 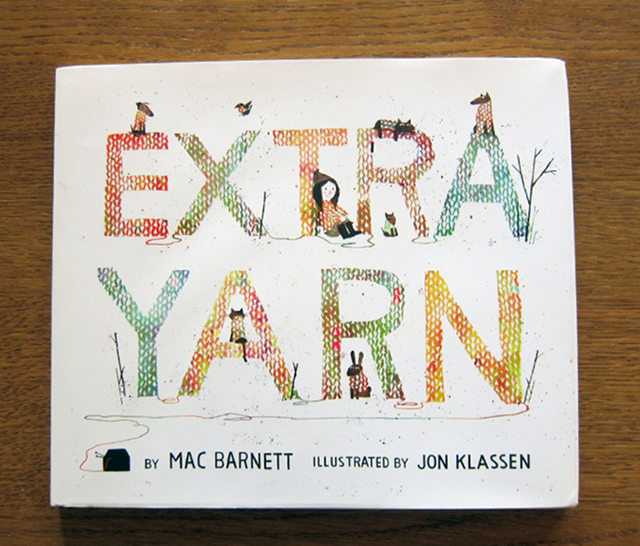 So I’m sticking with sharing Extra Yarn and using it to illustrate how the language of teaching comprehension strategies used in literacy can be math. 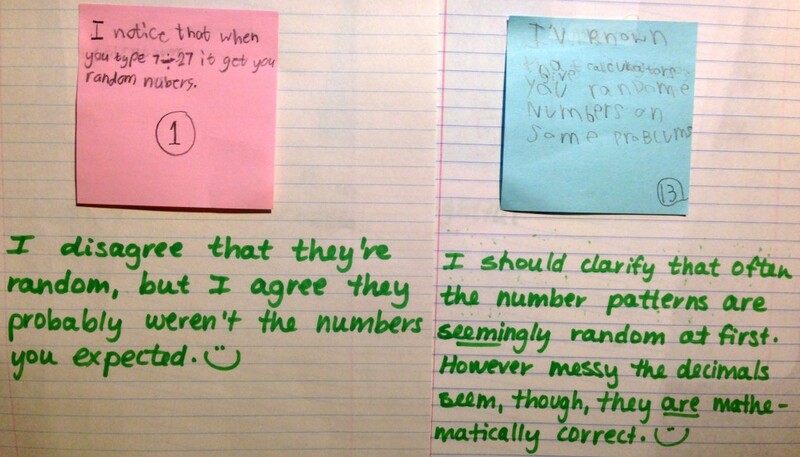 I’m sharing student-derived examples of how math can be taken from the book. People will be able to try out their own problems and I’ll post them on this site. New this year! Attendees will have the opportunity to rate presentations using the survey on the Dallas Conference App. • Presenter’s knowledge and understanding of the topic. I know I won’t be able to please everybody with my presentation, but JUST LIKE WITH OUR KIDS, it’s so helpful to know what I need to do with the end goal in mind, so seeing what I’m going to be rated on helps me narrow my mind from the bloom of concerns that are crowding each other out in my brain. One last worry that remains is that I’m breaking copyright laws by projecting Extra Yarn. But… a picture book read-aloud isn’t a freaking copyright violation, is it? Lawd help us if it is. 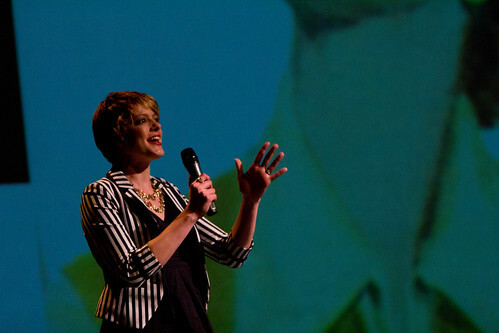 Oh, also, I’ve been working to make sure I won’t be doing emphatic karate-chop gestures all presentation long. Anyway. Enough. Time for lunch and reading. Author shannonPosted on October 10, 2012 October 10, 2012 Categories Literacy, Math, Read AloudsTags deepening literature connections, literacy, Math, nctm1 Comment on In Dallas! 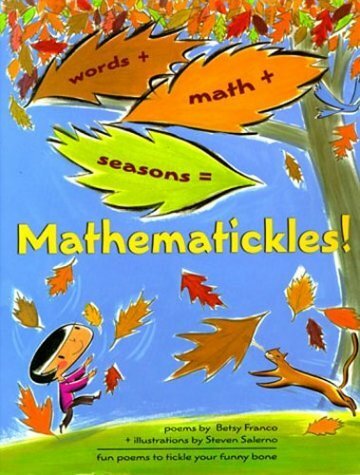 Book of the Week: Mathematickles! I feel like I’ve already written a post about this book, but I can’t seem to find a draft anywhere, so I’ll start again. 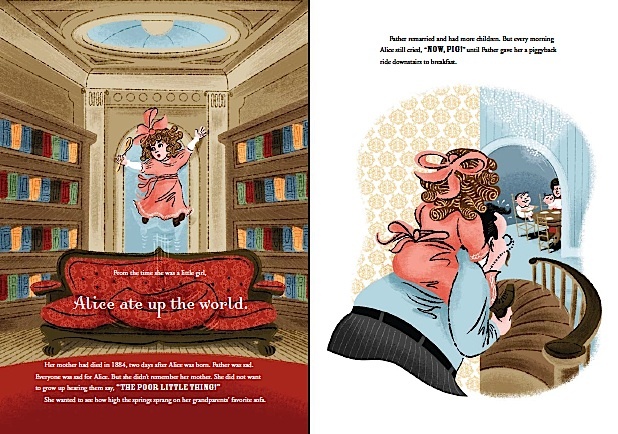 Poet Betsy Franco has recently received attention for her duo of domesticated animal books. A Curious Collection of Cats received some Caldecott buzz after it was published, and of course you know I’m cat biased, but I didn’t think A Dazzling Display of Dogs was quite as good as a followup. Anyway, back to Mathematickles. As usual, there are plenty of great math lessons available that tie into this book. 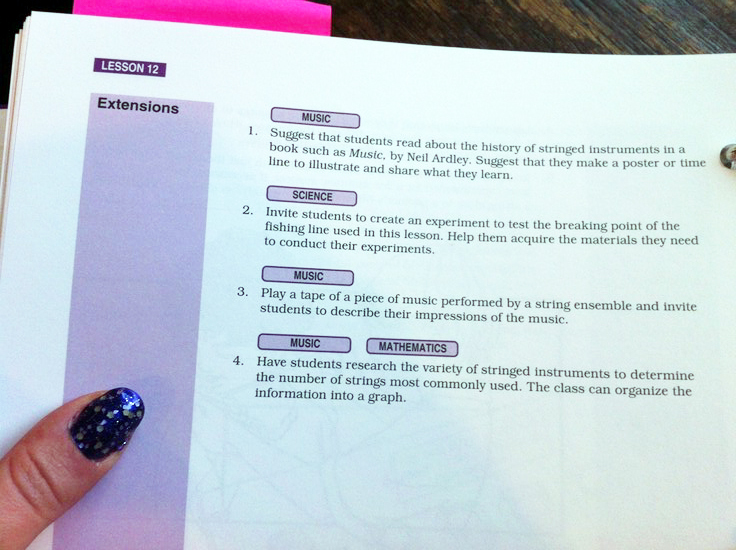 For example, you should definitely do this lesson. It has the added benefit of relating math to the seasons, and I plan to use this book to reinforce inverse operations for multiplication/division and solving for a missing addend. Recognize literary elements (figurative language). 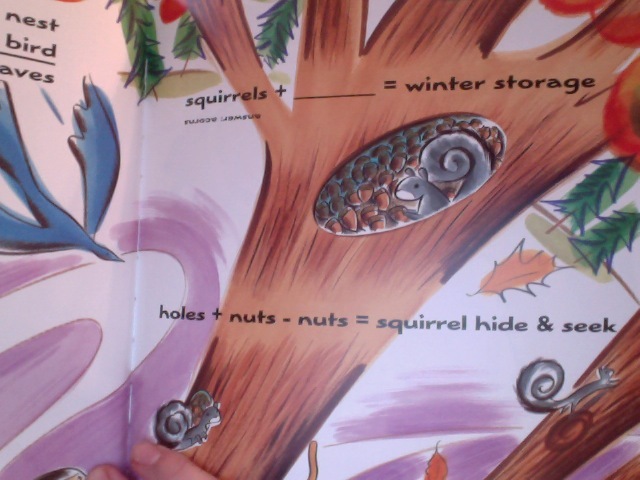 The book’s equations sometimes work due to literal language (like 1/2w = v = flying geese) and sometimes due to figurative language (such as raindrops x leaves = pearls on green plates). Due to the limited text in the book, it’d be pretty easy to copy several (dare I say all?) 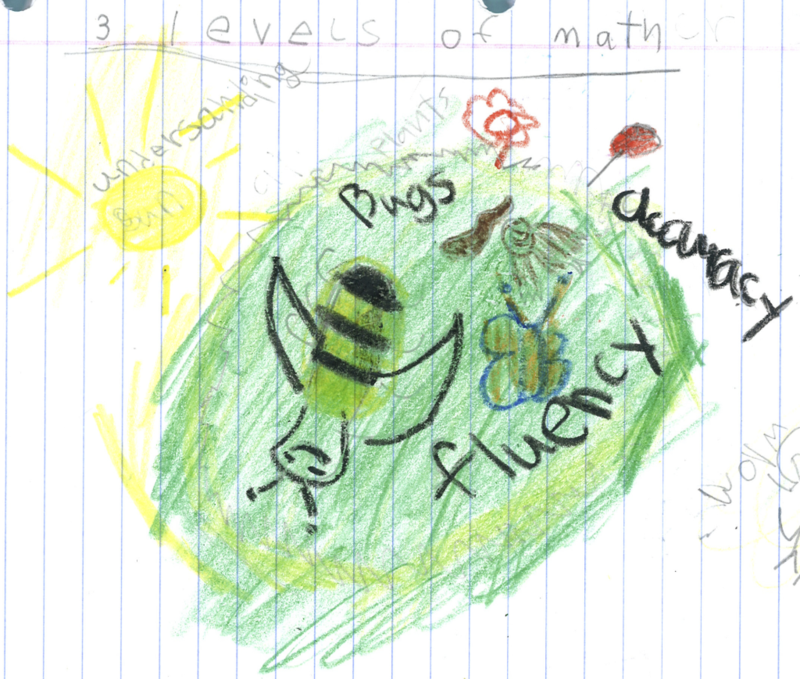 the poems an have students sort for the two elements. Use dictionaries, thesauruses and glossaries as tools. If some of the math terms or symbols are unfamiliar, students can use the glossaries in the back of their math textbooks. There are plenty of terms also available at the online dictionary MathWords. Read the whole time. As mentioned, this book doesn’t have very much text. So how can students make sure they’re reading the entire time, especially if they have lower-level books with limited words on each page? 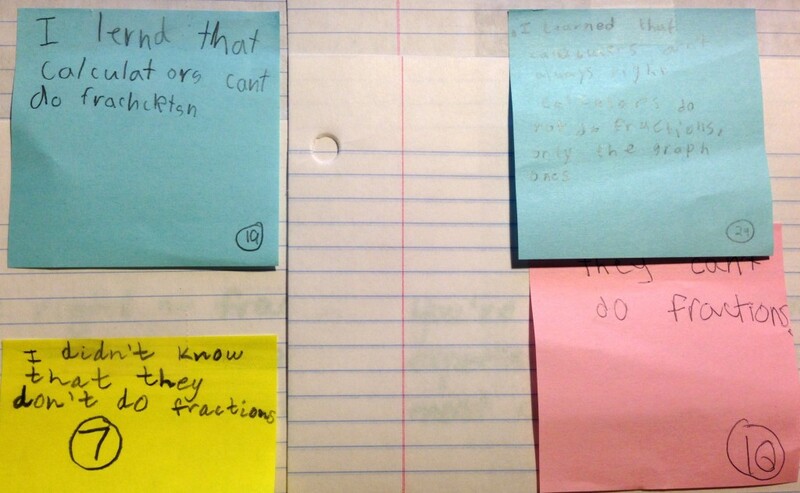 Brainstorm student ideas and post them in the room. Author shannonPosted on October 24, 2011 October 16, 2011 Categories Book of the Week, Literacy, MathTags behaviors that support reading, c14, cafe lesson, comprehension, daily 5, e7, expand vocabulary, learning, lesson plans, literacy, Math, read aloud, read the whole time, reading, teaching, the daily fiveLeave a comment on Book of the Week: Mathematickles!